Always outdoors? It’s about time you invested in a pair of Merrell Ventilator hiking shoes. Whether you’re embarking on an adventure or going for a long walk in the country, these hiking boots will ensure nothing slows you down. 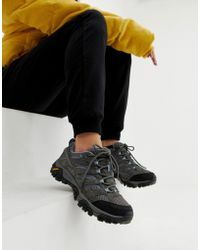 Featuring a mesh and suede upper, waterproof membrane and contoured footbed, the Merrell Ventilator hiking shoes are the best way to explore.